The U.S. economy grew at a 3.2% annual pace in the third quarter, more than analysts expected and more than a preliminary gross domestic product estimate of 2.9%. The Bureau of Economic Analysis cited higher consumer spending, which accounts for more than two-thirds of economic activity. Business investments continued to lag, but wages rose more than initially reported. Corporate profits rose 5.2% from the year before, the first gain in six quarters and the highest in nearly four years. The U.S. housing recovery continued in September with the S&P CoreLogic Case-Shiller home price index registering a 5.1% gain from September 2015. All locations in the 20-city composite index had price increases, and the Case-Shiller national index finally surpassed its previous peak, set in July 2006. A housing economist for the index forecast continued growth based on data showing rising sales of new and used houses and increased housing construction. The Conference Board said its November consumer confidence survey indicated stronger optimism toward the economy, encompassing both current conditions and near-term expectations. The monthly index from the business research group exceeded analyst projections and suggested a boost in year-end consumer spending. Consumer spending rose less than expected in October but more than initially reported in September, according to the Bureau of Economic Analysis. Consumer spending grew by 0.3%, half the rate of personal income growth in October, pushing the personal saving rate to 6% of disposable income. Gains in income and savings could bode well for future consumption. Spending rose 2.8% from the year before, after adjusting for inflation, above the long-term average. The same report showed inflation remaining below the Federal Reserve target of 2%. Choppy indications on housing included lower-than-expected pending home sales in October. The National Association of Realtors said its index rose for the second month in a row, although just 0.1%. The trade group still forecast a 2% rise in sales of existing houses this year, which would amount to nearly 5.4 million, the highest since 2006. The annual rate of construction spending increased 0.5% in October, staying around pre-recession levels. 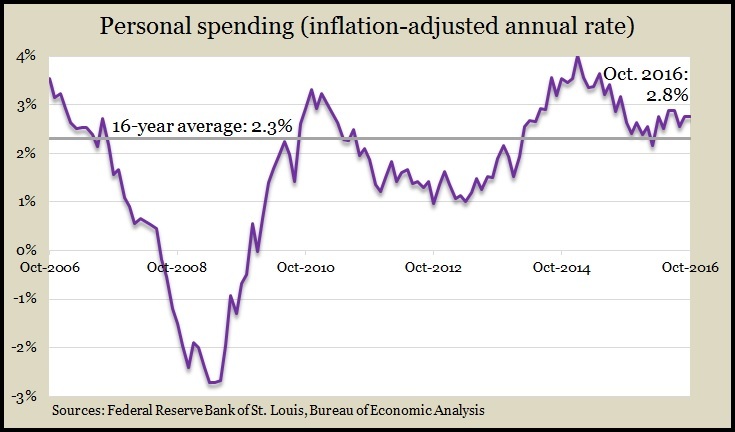 Spending rose 3.4% above the pace in October 2015. The Commerce Department reported that residential construction spending rose 1.8% from September and 4.6% from a year ago. The manufacturing index of the Institute for Supply Management fell in October and indicated expansion for the third month in a row. Of 18 industries in the survey, 11 reported growth. Manufacturing has been hampered by weak global markets and currency exchange rates that have made U.S. goods more expensive abroad. A component of the manufacturing sector – and one closely tied to consumer spending – the automotive industry had a slower pace of motor vehicle sales in November. At an annual sales rate of nearly 17.9 million vehicles, car dealers experienced a deceleration from pace both in October and the year before, according to Auto Data Corp. Year-to-year, trucks outpaced cars; domestic vehicle sales declined while imports gained. The moving four-week average for initial unemployment claims rose for the first time in three weeks, remaining 30% below the long-term average, according to Labor Department data. Persistently low jobless applications suggest an ongoing reluctance by employers to let go of their workers, which should strengthen the hiring market. Employers added 178,000 jobs in November, more than expected and just below the 12-month average of 180,000, which is lower than the 2015 average of 229,000. Data from the Bureau of Labor Statistics showed the pace of payroll counts picking up in health care, professional and business services and construction. The unemployment rate dipped to 4.6%, the lowest since August 2007, but it was more because Americans were dropping out of the labor force than that they were gaining jobs. Average hourly wages rose 2.5% from November 2015, continuing to outpace inflation but down from the 2.8% rise in October.